Day 2: Orange Expo 2011 Revisited! I felt my Day 1 at Orange Expo felt kinda rushed. There were things I missed, things I didn’t notice. So when the family wanted to go there today, I thought it’d be a good opportunity to go again. Turns out, I did discover a few new things. So this post will be less about the tech there, and more about the Expo itself, its organization, ideas and some suggestions to Orange, as I go through it. For this post, I’ll not make the mistake of trying to compare the Orange Expo with the expos you have abroad. They cannot be compared. 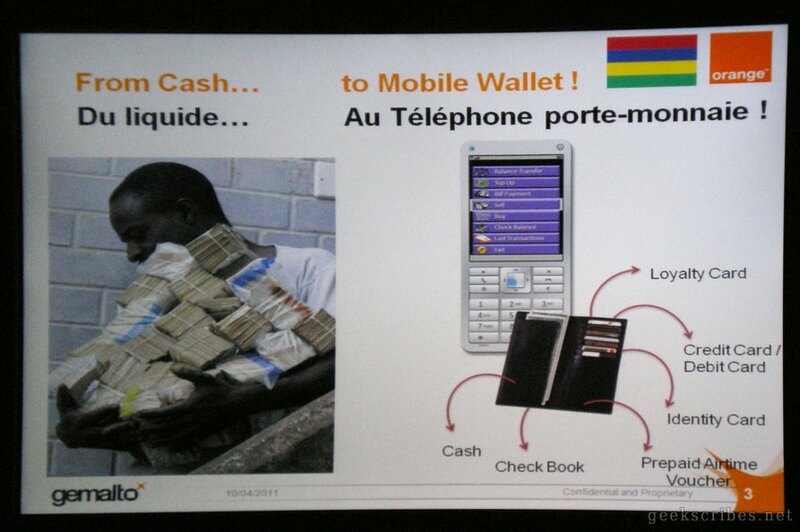 Instead, what we should be doing is comparing the Orange Expo 2011 with its peer: Infotech. 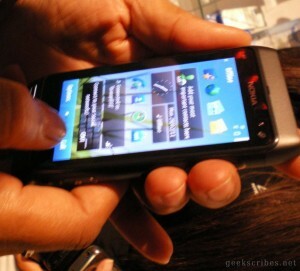 On Day 1, I wanted to see iPad 2 and Xoom and all the new shiny toys out there. As a geek, I wanted to see them, play with them. But I realized that many people who visited the expo today didn’t even know what an iPad was! To them, it was something new and wonderful. 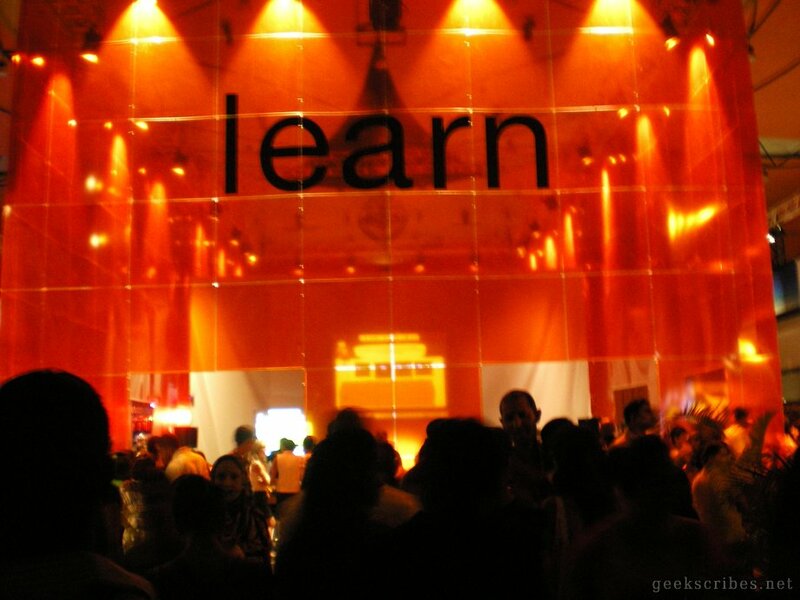 Today, this caught my eye: that Orange would put the Learn cube right in front of you when you enter the expo. They really wanted to emphasize how technology that Orange supplies will be making learning easier in the future. One really caught my eye: The MoLecture project. Those dudes did a cross-platform, virtual classroom. They were video-streaming from a laptop, directly to a browser and a Galaxy Tab. Multiple Galaxy tabs! It may not sound impressive like that, but if you consider just how many great things may be accomplished with that project, it’s stunning! Imagine you waking up late, and missing your lecture. You could just take out your mobile, connect to the web-classroom and start following as if you were there, video and sound included. You can even see who’s in the class and interact with the lecturer. And all this in real-time! Very impressive indeed. Another project was to pay bus fares with mobiles. Quite interesting too, and could possibly help with all the issues the Government is facing with free trips for students. There idea of showing students’ projects during the expo is laudable too. At least some of them will get the public’s attention on their projects and possibly get sponsorships later. I wish Orange would sponsor those projects. They could, like, offer to fund the most-voted-on Emerginov project and run it to completion, and then have the students market their product, all while having Orange’s brand on it. A great way to advertise the company, in my opinion. What would have been interesting at this expo is an “Explain” section, or whatever Orange decides to call it. There, you’d find a set of large screens in a sort of mini-classroom. People who are not familiar with technology would be able to go there and watch self-repeating videos that will tell them more about the expo. For example, the video might give them a tour, showing them the various products they will see, what they are and what they can do. It may explain a few terms like “Android”, “Tablet” etc… so that people at least have a brief idea of what they are looking at. It doesn’t have to be a long video; a 5 mins video would be sufficient. After the video, just show a countdown with “Session restarting in: <countdown>”. A simple thing which would have really helped today. It’s one thing to show people tablets and touchscreens, but it’s better if they know what they are holding. As a technology-following person, maybe you didn’t find the expo satisfactory. You didn’t find some mobile or tablet or some other device you were looking for. Maybe you didn’t get to subscribe to 100Mbps Internet. But try to forget that there is anything beyond the expo. Forget what you know about tablets. What if you went there, and for the first time ever, got to touch a computer so flat that it looks like a magazine in your hand. Imagine what you would feel. You, who don’t even have a computer at home, are now holding a cutting-edge device in your own hands! Let’s forget the newer devices for a moment. Orange did something fantastic here. It allowed people to test devices. 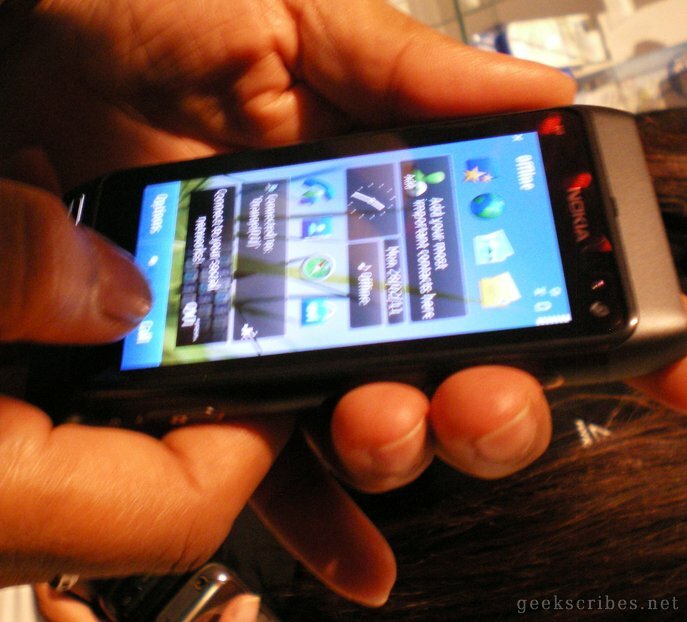 Ridiculously expensive devices. Everybody had opportunities to see an HTC phone, an iPad or a Galaxy Tab. That’s what I call putting technology in people’s hands. In the Day 1 post, I said I wished the Orange people would approach the public and explain what they were demonstrating. Maybe someone read my post, because today, I got served! Staff members! EVERYWHERE! The Orange-shirt wearing folks were literally, everywhere. They were demonstrating stuff and talking to the public. Overall, I got a better understanding of the Business Area, and the various projects at the Emerginov area. I said this before: I wish Orange recorded the conferences and put them online for other people to see. Unfortunately we will most probably not find the conferences online. Another thing that surprised me is that Orange didn’t make use of the Internet enough. Strange, when you realize Orange is an ISP! Where are the tweets regarding promotions? Tweets about live pictures from the expo? Live Facebook updates about curiosities? Or “If you are reading this, run towards Stand X and get 25% discount in the next 5 mins!”. Alright, they DID tweet at the event. Check it out here. See the timestamps? I’d think that for such an expo, we’d be getting every-5-mins updates, but no, sorry. The picture above shows all the relevant tweets on the channel. Not many, huh? 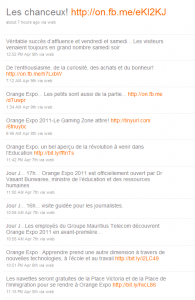 Beyond the expo, Orange should try to reach out to its customers via the web. Like, offer special discounts online or promo codes etc. Get that Twitter channel more active, and also increase their social-network presence. It’s funny… how an ISP is not using the Internet to its full extent! Friend of mine told me this. The expo today certainly looked like a family event, with kids roaming around, a large number of young people, accompanying their parents and explaining stuff along the way and people making good use of the seating arrangements conveniently put at various locations. It’s great to see families and young people showing interest in technology, but the question remains: “should a technology expo be considered as a family event?” I’ll leave that for you to answer. 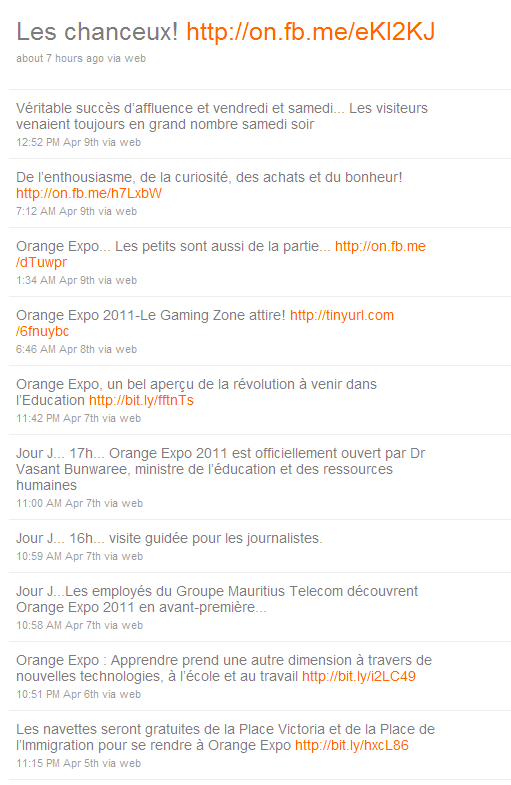 In the end, the Orange Expo 2011 was not a let-down. Certainly, the absence of the latest in technology was noticed. “An utter bore-fest for the geeks.”, as said by Carrotmadman6. But let’s be realistic: They did the best they could with what they have. They certainly introduced a few innovative concepts, and showed non-geeks what technology can do. For geeks, maybe next time! I stand by my opinion: If you went to Expo 2011 for the latest, shiniest gadgets out there, you’ll be deceived. If iPad, Galaxy Tab and HTC are not familiar names to you, you must have enjoyed yourself. Now, let’s hear your views, people! NetPC, Low-cost AMDs, Asus Eee: Which one is best for me? Orange Expo is AWESOME!!! * | *If you’re a n00b. What I don’t like (absolutely hated) is how n00bish the staff themselves were. Lack of basic knowledge of the products meant that when people were asking them questions, they were distorting the facts & misguiding them. As one woman asked, why would I buy a smartphone when a tablet (Galaxy Tab) is being priced similarly? Reply – the smartphone has a better camera. Yeah, they’re not very knowledgeable about the products they are selling. @Kyu: Good things are to be appreciated and shown to the world. The MoLecture, imho, has a great future potential. Try imagining such a system deployed at UoM. Would solve a LOT of the space and infrastructure issues they are having. Lectures being webcast, saving students the need to use transportation… It’s a great project!